After shopping and generally being lazy in Figeholm, we set off just after 11am to head for Alo. The wind was light and while we managed an hour or so of sailing, most of the 20 mile passage was under power. 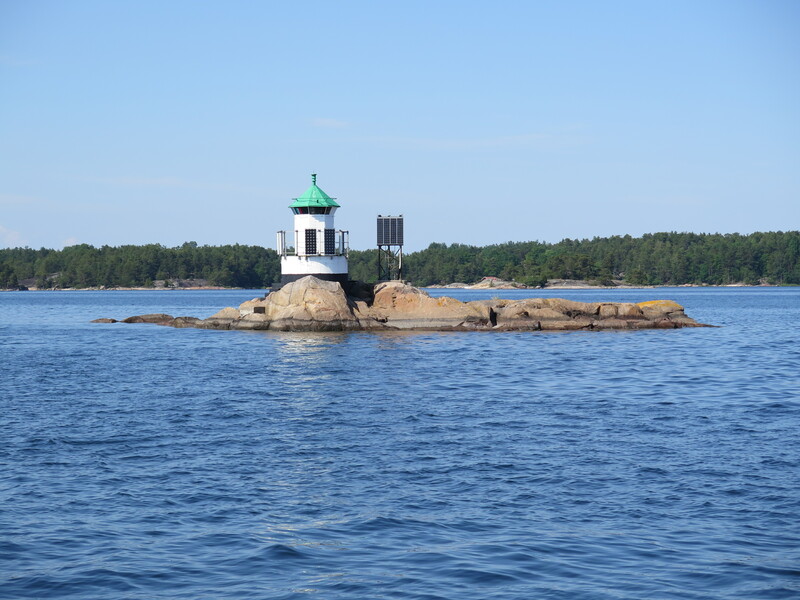 However, the weather was beautiful and the route through the archipelago more than made up for the lack of sailing. While we followed Airborne for most of the way, we were also following the route carefully on the chart. In fact we got a great routine going. Ric followed the route on the iPad and plotter while Jilly marked off where we had gone on the paper chart in the cockpit. Weaving around through the inshore channels, it is surprisingly easy to lose where you are, so marking things off as you pass them is a great help in keeping track of the pilotage. While the Navionics charts on the iPad are excellent and great for the minute by minute navigation, it is a help to look occasionally at the paper chart for an overview of the route and what is coming up. The paper chart helps give a context for the electronic ones. Alo itself was stunning. Pat and Stephen had been in before and warned us of a rock on the northern side of the narrow entrance. It is worth keeping closer to the southern shore to avoid it. However, if I thought the entrance was narrow, that was nothing compared to the next bit. Everyone on board was breathing in as we went through the gap and if we could have persuaded the boat to breathe in as well, we would have done. 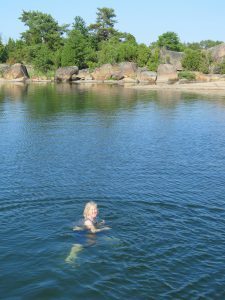 However, there was plenty of water between the steep-to rocks and, once through, it opens up into a beautiful anchorage. The plan was, given it is an anchorage, to anchor – an ambition which was slightly frustrated by the fact that the anchor pin had bent, holding the anchor firmly onto the bow roller. Presumably we have nudged a quay somewhere without realising and bent the anchor pin. Twenty minutes of persuasion (of the brute force and ignorance variety) finally got the pin out thanks to Ric’s tenacity, while the rest of us were just relieved not to get dizzy any longer from going round and round in circles while we waited. Once anchored, we could take in the beauty of the anchorage. 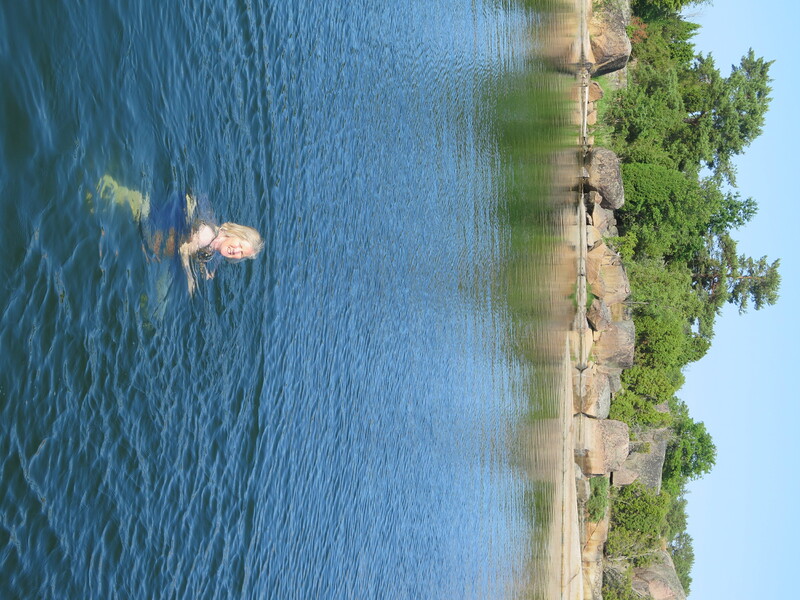 There are a few holiday homes around the bay, but these are not at all intrusive and it was incredibly peaceful. 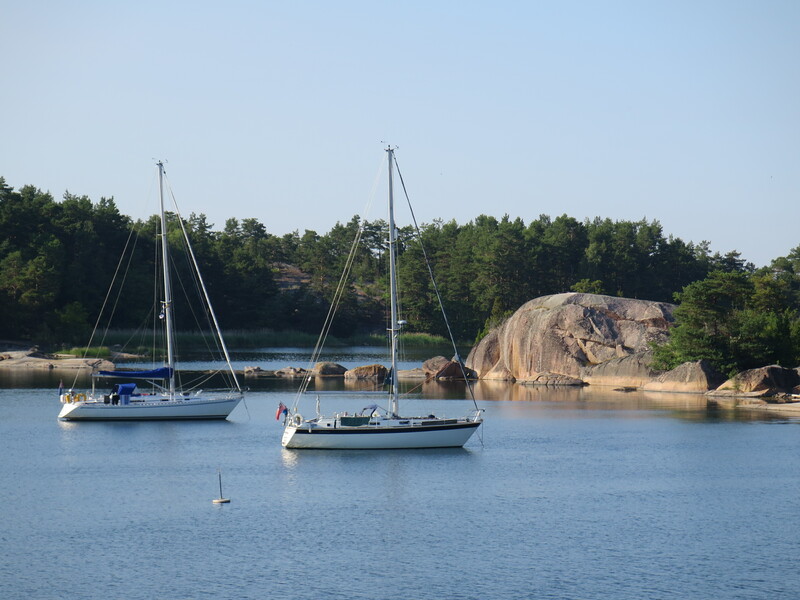 After a very pleasant swim, we took the dinghy ashore for a walk on the island, which is beautiful – trees and rocks being the staple scenery.